Named for a treacherous strait between Green Bay and Lake Michigan, Death’s Door Gin is hand-crafted with organic red wheat and wild juniper berries harvested locally on Washington Island. The gin is triple-distilled in small batches, in a 90-gallon copper still. 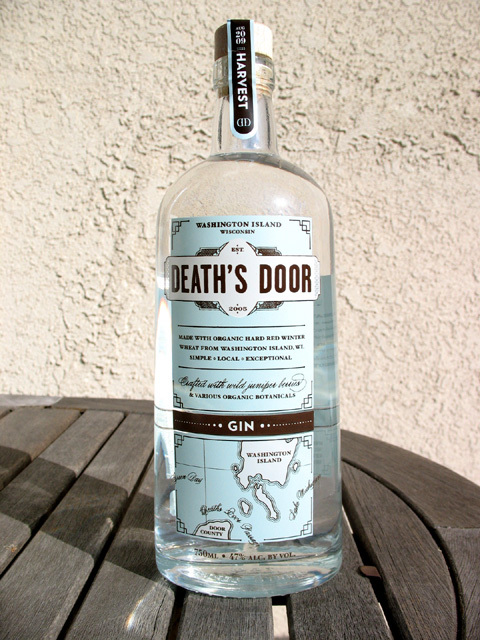 In addition to gin, other expressions in the Death’s Door range include vodka, white whisky, and a “bartender-strength” (100 proof) version of the white whisky. Death’s Door artisanal spirits are produced by Washington Island Brands, a collective of farmers, restaurateurs, and local food advocates dedicated to restoring the agricultural economy of Washington Island, WI and celebrating the food and flavors of the Great Lakes region. With a name like Death’s Door, one imagines an ominous-looking bottle filled with a viscous substance and bits of animal floating in it. In fact, the design is more akin to something you’d find in a boutique hotel. There’s a nice heft to the apothecary-styled glass bottle, with a clean label design that displays a stylized map of the Death’s Door passage. The bottle is topped by a natural cork with a seal that shows the month and year of harvest (mine read “August 2009”). The flavor profile is as clear and minimal as the bottle design: the only botanicals in Death’s Door are locally-sourced juniper, coriander, and fennel seed. It’s a balanced, sublime gin ready-made for cocktails. The gin recipe was created by Leah Caplan (Executive Chef at Metcalfe’s Market), who says, “The flavors came together naturally and the results are crisp, clean and refreshing.” From Kaplan’s less-is-more approach, the accolades for Death’s Door have flowed, including being named Best Gin of 2009 by Wine & Spirits. Nose – Each botanical is distinctly present, from the initial hit of wild juniper to the coriander and fennel. Taste – Crisp and bright; aromatic juniper at first, then sweet citrus, and earthy pepper notes at the end. Finish – Long and smooth. Food GPS has a Q&A with Death’s Door President Brian Ellison.